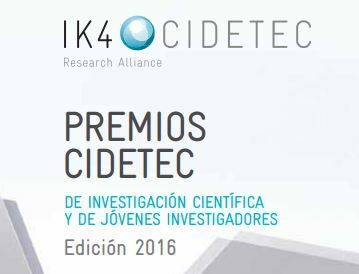 The CIDETEC 2016 Award for "Scientific Research", totalling 4,000 euros, has been awarded to the research in Electrochemistry carried out over the last four years by the research team represented by Professor D. PEDRO GÓMEZ ROMERO from the Institute of Nanoscience and Nanotechnology of Catalonia. Also, the CIDETEC 2016 Award for "Young researchers", endowed with 2,000 euros, was awarded to Ms. MARÍA ESCUDERO ESCRIBANO of the University of Copenhagen. In addition to Dr. Gallardo of the Autonomous University of Barcelona, the panel was made up by Dr. Vicente Montiel, of the University of Alicante, Dr. Álvaro Colina Santamaría, of the University of Burgos and Dr. Inmaculada Ortiz Uribe of the University of Cantabria, and acting as secretary, Dr. Hans-Jürgen Grande, of CIDETEC. The CIDETEC awards are aimed at promoting the scientific study, technological development and industrial innovation in all types of electrochemical technologies. Applications in the form of Scientific Research have been assessed according to scientific quality criteria in aspects related to the relevance of the results, industrial applicability and the novel aspects of the research carried out in the field of Electrochemistry. On the other hand, the evaluation of the applications in the modality of Young researchers was performed according to the criteria of the quality of the scientific production, excellence of the candidate’s CV and contribution to the progress of Electrochemistry. The prizes will be awarded in conjunction with the XXXVIII Meeting of the Group of Electrochemistry of the RSEQ to be held in Vitoria-Gasteiz during the month of July 2017. During the meeting, the winners of each of the two modalities will offer a conference related to the content of their candidature.